​​Every donation helps A Kitty's Purrsuit of Happiness continue in our mission of saving kitties from the streets & dangerous situations “From Starvation to Salvation.” We rely 100% on volunteers, donations & FUNdraising programs. Many companies offer a payroll deduction where a percentage or portion of pre-tax wages is regularly deducted or Donation Gift program for donating directly to a non-profit organization. To find out if you or your spouse's employer offers such, contact your Personnel or Human Resources office. AmazonSmile is a website operated by Amazon that lets you enjoy the same wide selection of products, low prices, and convenient shopping features as on Amazon.com. 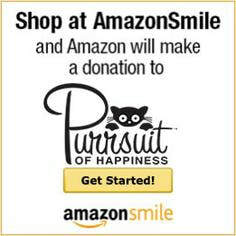 The difference is that when you shop on AmazonSmile (smile.amazon.com), the AmazonSmile Foundation will donate 0.5% of the purchase price to A Kitty's Purrsuit of Happiness as your preferred charity. (You must select our charity and sign up with AmazonSmile for this to occur). Please click on the Shop at AmazonSmile image to get started - once your account is registered, please remember to be in the "AmazonSmile mode" to make your purchases count towards a donation. Thank you! Use Goodsearch as your choice of search engine Download the Good shop App​. Click on each image to learn more! ​Please check back for future fundraising events! ​Please participate and donate with your winning bid on some really awesome kitty things. If you have items that you would like to donate for our FB auctions, please email us - thank you for participating! ResQwalk is a mobile app that enables you to raise money for Kittys PURRsuit of Happiness and earn prizes every time you go for a walk, run, bike or hike! Each week a donation pool (e.g. $2,500) is announced and in order for KPOH to receive donations from the pool, you simply need to check-in to the app press the HUGE GREEN START button and away you go! Each participants distance is recorded in the user profile and added to KPOH's weekly sum. At the end of the week donations are paid out to the rescues proportionally to the total distance walked. 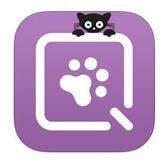 Please download the ResQwalk app on your smartphone, choose Kittys PURRsuit of Happiness as your choice of Rescue - and not only help the kitties, but record your own fitness achievements as well! Feed Your Kitties a Meal of Sardines! Donate ANYTHING from our Amazon Wish List! 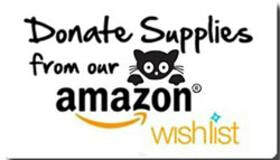 Donate any Food Item from our Amazon Wish List!